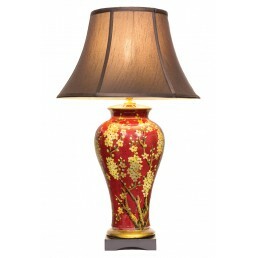 Our collection of traditional authentic Chinese lamps will illuminate any room with splash of the Orient. 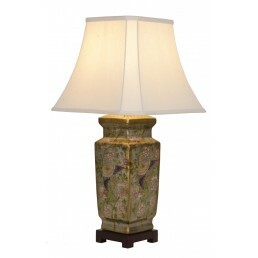 They are perfect for any traditionally styled room or can be used as a unique feature in a contemporary room set. 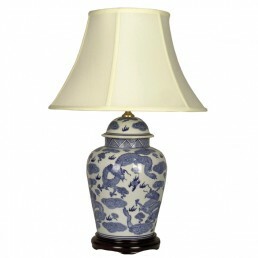 These Oriental table lamps have either porcelain or pottery base and include the lampshade as shown. 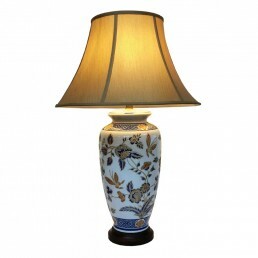 Each lamp base is hand-decorated with exquisite detail depicting traditional Chinese designs and a are a true replica of the ancient Chinese designs. 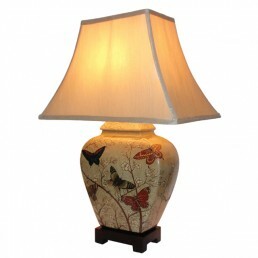 Many of the beautiful designs include dragons, butterflies, goldfish, flowers and scenery. 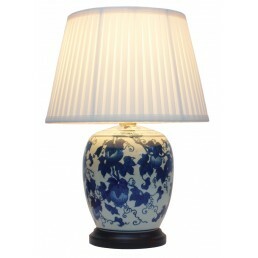 The Lian Wen Vase Lamp is made from an elegant porcelain vase and is part of our Ashmolean collec.. 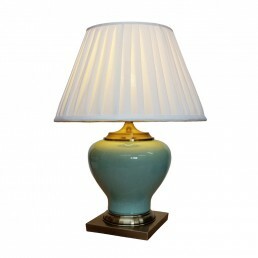 The Shi Liu Lamp is made from the Shi Liu ginger jar and is part of our Ashmolean collection. Dec.. 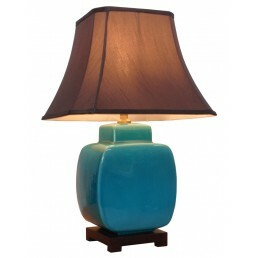 The Zhi Que Lamp is made from the Zhi Que Flask and is part of Ashmolean Collection. Decorated wi.. 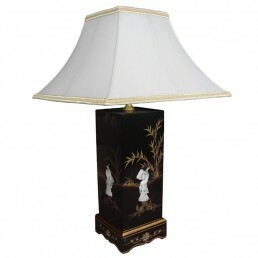 Single table lamp depicting a typical Chinese garden scene featuring Chinese ladies, this stunnin.. 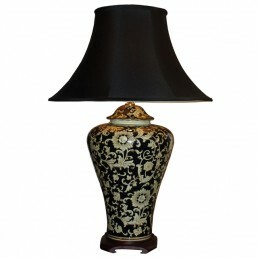 Pillar vase lamp in antique gold with embossed floral and phoenix decoration. 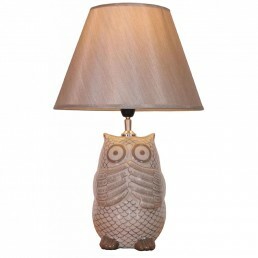 Lamp base heig.. 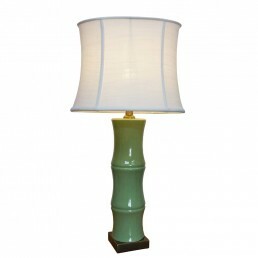 Tall green porcelain lamp in the shape of a thick piece of ribbed bamboo. Constructed from a 37cm.. 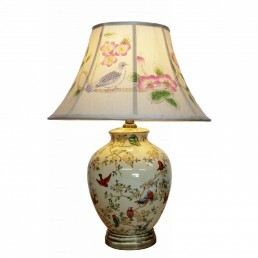 Tall golden jar lamp in a flattened ovoid shape with hand-painted colourful birds and flowers dec..
Porcelain general jar lamp hand-finished in black with white blossom design. 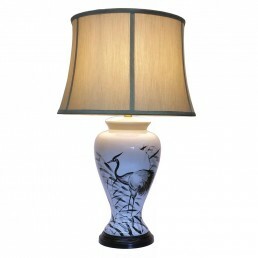 Constructed from a 3..
Vase lamp with birds and blossoming branches decoration etched in black an white on a cross-hatch..
Porcelain Vase Lamp in white with patterns of concentric blue rings. 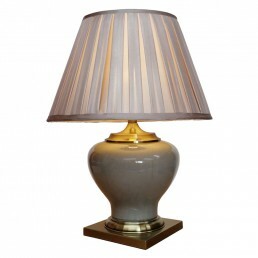 Constructed from a 30cm porc..
Square Bottle Lamp in a metallic bronze finish with contrasting quarters on front and rear faces .. 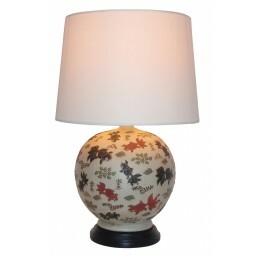 Round bottle lamp decorated with textured black and red Chinese goldfish swimming among bubbles a..
Flat-sided jar lamp in olive cream with multicoloured butterfly and blossom design. 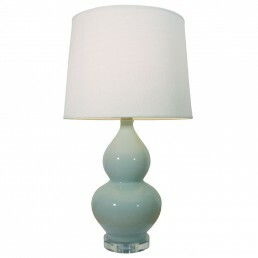 Constructed f..
Square tea caddy bedside lamp with blue swirling floral decoration against a pale blue/green back..
Hulu-shape porcelain lamp in a pale translucent crackled ice-green finish. 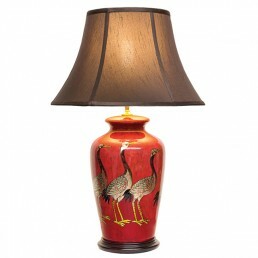 The hulu gourd has str..
Vase Lamp in rich red with a queue of black and gold cranes in an aged metallic finish. Construct.. 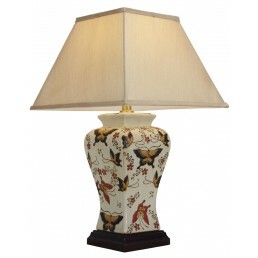 Tall porcelain vase lamp decorated with large, colourful butterflies on a creamy background. 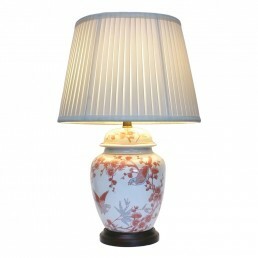 Cons..
Melon jar lamp in brick red with pale golden decoration of flowering daffodils. 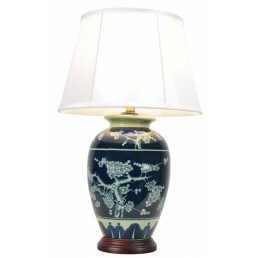 Constructed from ..
Vase Lamp in dark blue with pale blue/green design of blossom laden branches. Constructed from a .. 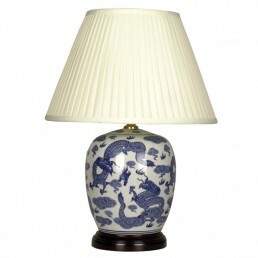 Round melon jar lamp in white with blue decoration of dragons chasing a flaming pearl among the c..
Owl Lamp in cream with brown detail, Constructed from a 23cm porcelain figure with a pale golden ..
Large shoulder jar lamp in glossy midnight blue to black with swirling golden floral design. 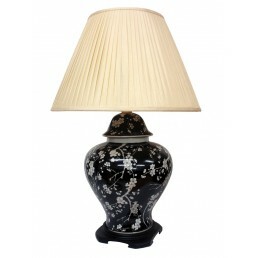 Cons..
Square pillar vase lamp in grey with black floral motifs. 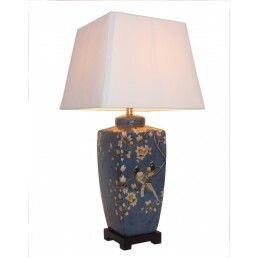 Constructed from a 40cm porcelain vase .. 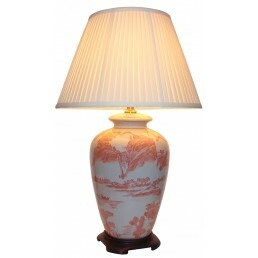 Tall Vase Lamp in white with blue and red blooms and butterflies all highlighted with textured go..
Classic Oriental Vase Lamp with pink/red design of fan-tailed goldfish swimming among bubbles and..
Vase lamp with birds and blossoming branches decoration etched in black an white on a brushed tur..
Squared porcelain jar lamp in cream with red decoration of double happiness character among leafy..
Classic Oriental Vase Lamp with blue design of hibiscus leaves and flowers on a neutral biscuit b..
Vase Lamp in white with black ink-style decoration of a heron wading among reeds. 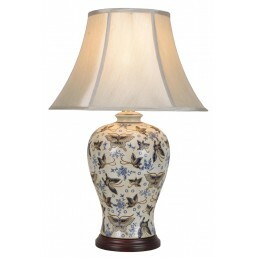 Constructed fro..
Vase Lamp in ivory with blue and silvery butterfly pattern in etched relief with a lovely tactile..
Ivory white teardrop-shaped porcelain lamp with a very finely crackle-glazed translucent finish. 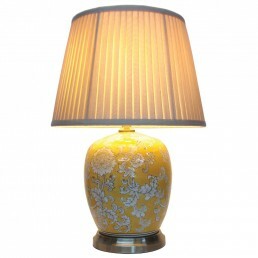 ..
Flattened six-sided jar lamp in white decorated with fine leafy pattern with flashes of yellow, b..
A multitude of colourful birds perched on, and flying around branches thick with spring blossom o..
Melon Jar Lamp with floral decoration on an imperial yellow background. 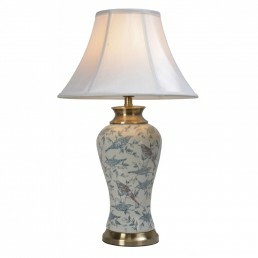 Constructed from a 23cm p..
Square Vase Lamp decorated with butterflies in white and turquoise on a pale green base. 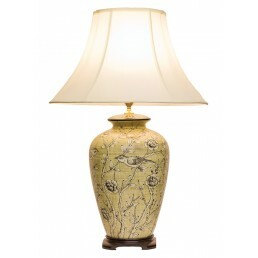 Construc..
Porcelain Vase Lamp decorated with a scene of crested parrots amidst a flowering vine against a c..
Melon Jar Lamp in crackle-glazed white decorated with a spreading passion flower vine attracting .. 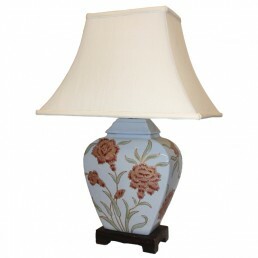 Shoulder vase lamp in creamy white with red and maroon floral decoration and leafy swirls. Constr.. 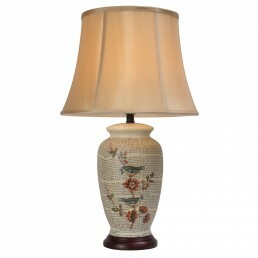 Tall tapering ceramic bottle lamp with hand painted blossom designs in brown and red on an aprico..
Large porcelain vase lamp in white with red willow pattern scene of trees, lake and mountains etc.. 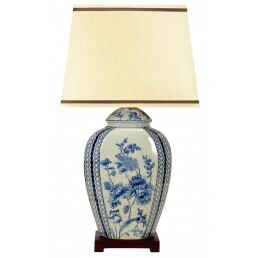 Round lamp with floral decoration in blue on a finely crackled ivory base. Constructed from a 16½.. 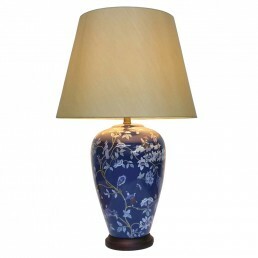 Tall Vase Lamp in striking royal blue decorated with a flowering creeper. The Jiaogulan vine is c..
ade green meiping vase lamp with a delightful round shape, in fine crackle glaze Ru ware porcelai..
Square vase lamp in brushed white shabby chic finish over floral motifs picked out in relief. 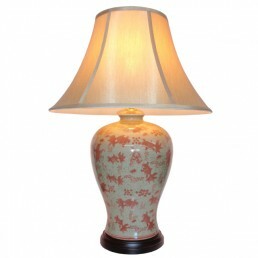 Con..
General jar lamp in white with decoration in blue of dragons chasing a flaming pearl among clouds..
Smoky grey meiping vase lamp with a delightful rotund shape, in fine crackle glaze Ru ware porcel..
General Jar Lamp decorated in red and grey with sparrows among bursting blossom and fresh young l..
Flattened Jar Lamp decorated in blue with generous sprays of flowers on a pale blue/green biscuit..
Square Jar Lamp in smoky blue decorated with striking crested birds perched on sprigs of magnolia..
Large General Jar Lamp strikingly decorated with twisting dragons among leaves and blooms in red ..
Square vase lamp decorated with textured butterflies in black, red and mustard on a creamy backgr..
Vase Lamp decorated with hand-painted jasmine blossom on gnarly mature tree branches against a ri..
Squared Jar Lamp in crackled translucent turquoise. 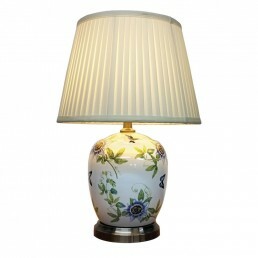 Constructed from a 30cm porcelain jar mounted.. 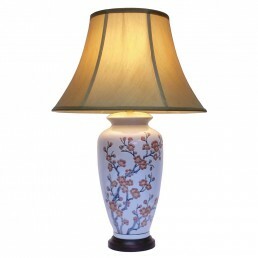 Tall Vase Lamp with spreading twigs laden with red and yellow peach blossoms against a pale off-w..
Square vase lamp in rich glossy purple decorated with blossoming twigs in white. 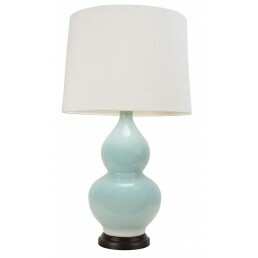 Constructed from..
Classic Vase Lamp in pale duck-egg blue with dark veined crackle finish. 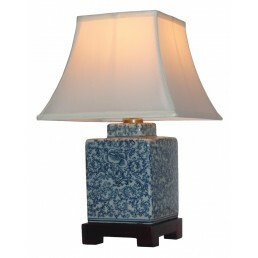 Constructed from a 33cm ..
Large shoulder jar lamp in crackled ivory porcelain with blue swirling vine design. Constructed f.. 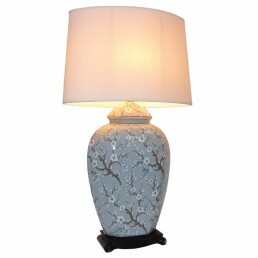 Oval jar lamp in pale grey with twigs of white blossoms. 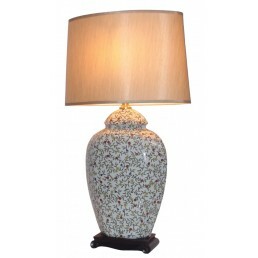 Constructed from a 38cm jar mounted on a..
Porcelain vase lamp in a pale off-white colour featuring a collage of birds and leaves in pale bl.. 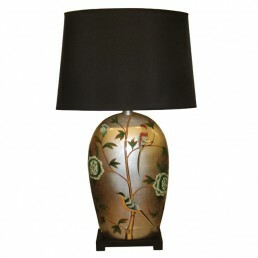 Tall Melon Jar Lamp in gloss black with flowering stems in metallic gold. Constructed from a 35cm.. 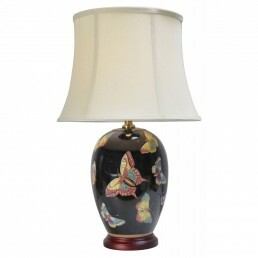 Tall melon jar lamp in gloss black decorated with a kaleidoscope of butterflies. Constructed from.. Tall Vase Lamp with birds like bluetits among flowering quince branches against a backdrop of age.. 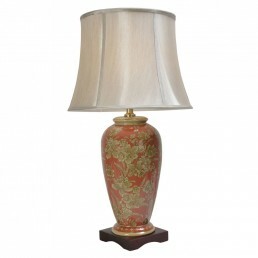 Tall vase lamp in brick red with pale golden decoration of flowering daffodils. 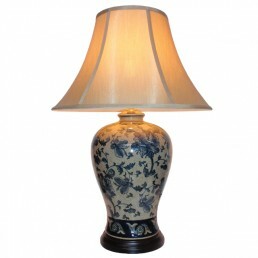 Constructed from ..
Large general jar lamp in white with decoration in blue of dragons chasing a flaming pearl among .. 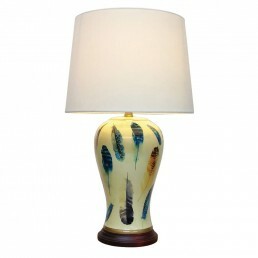 Tall Vase Lamp in creamy yellow decorated with an abundance of colourful feathers. 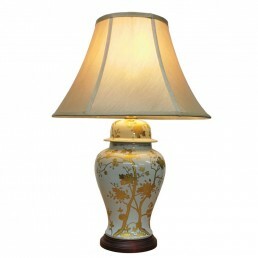 Constructed fr..
Flat sided jar lamp in off-white decorated with sworls of trumpet flowers and edged with a floral..
Large general jar lamp in white decorated with stems and flowers in striking metallic gold. Const.. This video provides a fascinating insight into the birth and development of Chinese porcelain and how it has changed the world today. 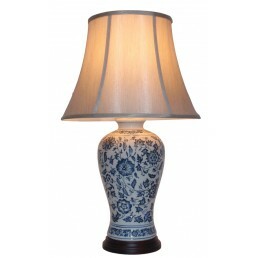 Although our Chinese porcelain table lamps are produced in a slightly more modern way, they are still hand-made and the designs still feature those from the ancient dynasties of China. During the course of civilisation the invention of pottery made from clay was an event that occurred among many ancient peoples all over the world. 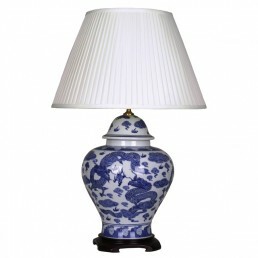 The invention of porcelain however was unique to the Chinese and the birth of porcelain changed the appearance of pottery forever. 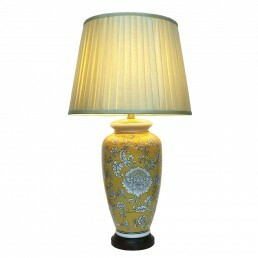 Aside from its mysterious shine resembling that of crystal minerals porcelain imbued pottery with a dream like sole of great beauty. How did ancient Chinese people accomplish this? 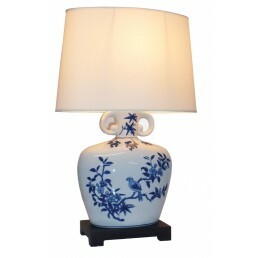 And how did they push the beauty of porcelain to its limits. The feudal history of China lasted more than 2000 years. 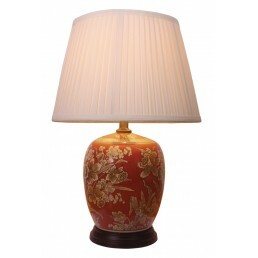 To exhibit the supreme power of the emperors the leaders of all the Chinese dynasties spared no effort or expense to obtain all possibilities under heaven and to satisfy their greed individuals bringing precious gifts as items of tribute streamed in and out of the royal palaces while local officials busied themselves gathering the most talented craftsmen. All possible resources were channeled to facilitate the creation of exquisite, one of a kind items, simply for the pleasure of the ruler. Extremely valuable porcelain ware was no exception and was finding its way into the royal collections.